Sectional garage doors are an incredibly popular choice with home owners for a myriad of reasons. As the name suggests they are made up of individual sections (rather than a single panel) and open vertically. This means you can pull your car right up to the door without having to leave room for it to swing open; this is ideal if you have a short driveway so you do not have to leave your car overhanging the pavement or the road. It also works well if you regularly access your garage through the main door and don’t want to have to move your car every time you do so. A sectional door also means you don’t lose any of the height or width of the garage so is ideal for wider vehicles such as four by fours or people carriers. If your garage is not used to park cars then a sectional door is still an excellent option because the premium ranges are insulated with CFC-free PU foam. Whether it’s a gym, office or playroom the garage will benefit from the high quality thermal insulation and the sturdy rubber weather seal which prevents dirt, leaves or mice entering. An insulated door is also worth considering if the garage is integral and there is a bedroom above. For those who do not require insulation, single skin sectional doors are available. Sectional doors come in a variety of finishes including powder-coated steel and decograin. The standard steel doors are white however they can be finished in any colour to complement the rest of the property. 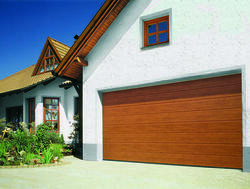 Decograin doors have a timber effect finish. The doors also come in a variety of sizes and can be made to order to fit the most challenging of shapes. All sectional doors can be automated meaning they are the perfect option for anyone looking for an attractive, secure, simple to use door which gives the user maximum space. If you’re looking for a new sectional garage door in Hertfordshire, then you’ve come to the right place! Give us a call, pop into our showroom or email us for more information. Previous: Previous post: Why choose a side-hinged garage door?